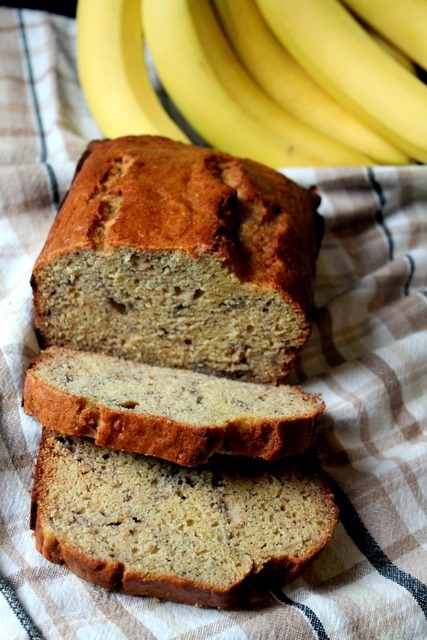 One can never have too many banana bread recipes, right? A couple of weeks ago, I told you guys I set out and did some weekend baking. While the baby slept and the hubby was working outside, it was so nice to just be in the kitchen alone with the music on, and not another care in the world. Sometimes, just a little time spent like that is exactly what I need! Because other times, you know, I’m chasing around this little man while also trying to teach him the whole “no biting” thing. Yeah, he got me good yesterday in the arm and, well, let’s just say that did not go over well for anyone. 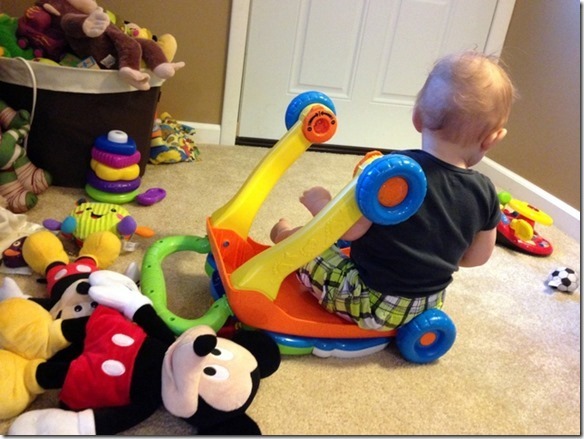 Oy vey… Oh, and that’s his new favorite chair, in case you were wondering. He flips the thing upside down and sits and plays with the wheels. Thinks it’s the greatest thing ever. 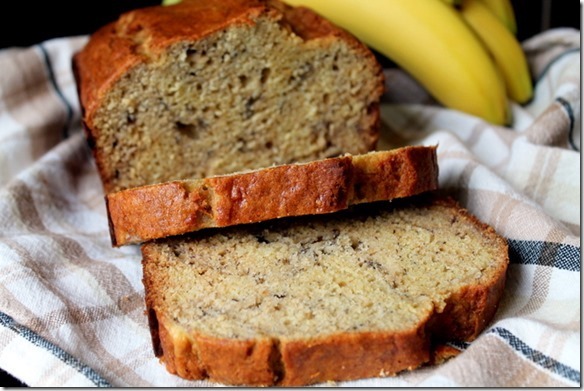 But anyways…let’s get back to banana bread. Grandma’s Banana Bread, specifically, because it was actually my grandma’s recipe books that inspired me to bake this one up in the first place. For those of you who have been with me from the beginning, you probably already know that Jay and I live in my grandparents’ old house. I grew up coming to this house and having sleepovers as a little girl, and it’s been so great to keep it in the family and update it along the way. There’s actually still a fair amount of random odds and ends around the house that belonged to my grandparents. Some of them we just have no use for and toss out here and there. But others I’ll keep forever…like grandma’s recipe card books. Ahh, before there was the internet. Look at that…people still survived and managed to cook well. I love looking through her recipe cards every now and then, not only to see what kind of recipes she’d clip, but also to see her random little notes. Things like “John loved!” (my grandpa), or something simple like “nice” up in the corner like the one above. Gosh, I miss them sometimes. Luckily for me, Grandma knew her way around the kitchen, so the recipe cards I have left from her will certainly do me no wrong. So I took inspiration from a couple different recipes in her cards for cakes and breads and ended up making this gem. It’s simple. It’s easy to whip up. It’s unhealthified (just as grandma’s baking always was and should have been). And it’s delicious. You’ve gotta give it a try! Preheat oven to 350 degrees F. Spray a 9×5 loaf pan with cooking spray. Sift the all-purpose flour, baking soda, and salt together, stir in whole wheat flour, and add to the creamed mixture, mixing well. Fold in the mashed bananas and vanilla. Pour mixture into loaf pan. Bake on center rack of the oven until a toothpick inserted in the center comes out clean, 50-60 minutes. Cool in pan for 10 minutes then on a rack. Enjoy! What are some of your favorite meals or baked goods that your grandma or grandpa makes/used to make for your family? I have some of my grandma's recipes as well and they're so special to me. She was the queen of cookies! I literally make banana bread on a weekly basis once our bananas turn brown! Ill have to try this recipe. My grandma makes a riiiiiidiculous banana cake with riiiiiidiculous frosting (hello, powdered sugar!) seriously, so good. 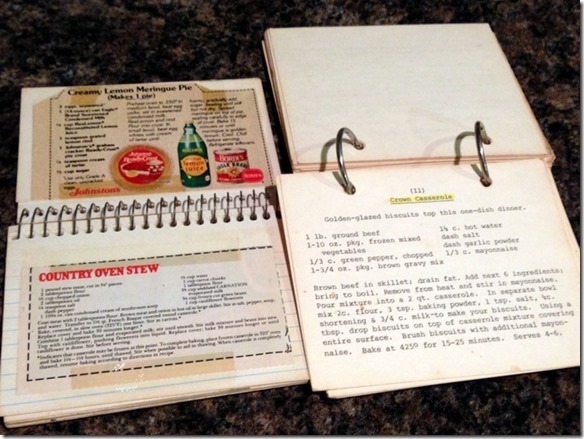 Wow I love that you have your grandmother's old recipes! 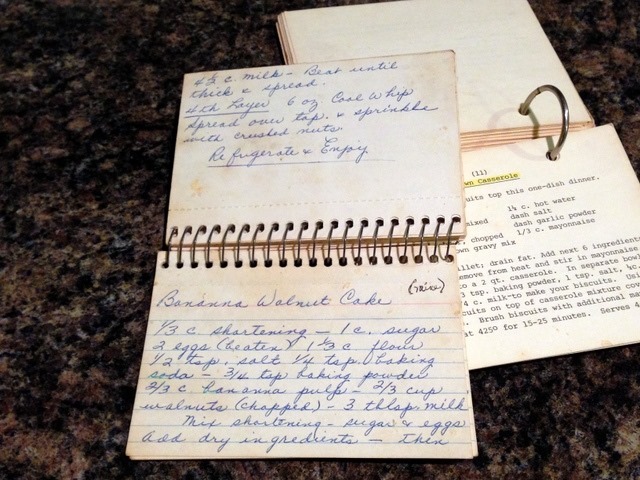 I have a few of my grandmothers old cookbooks and love to see her handwriting in the margins! What a special gift! 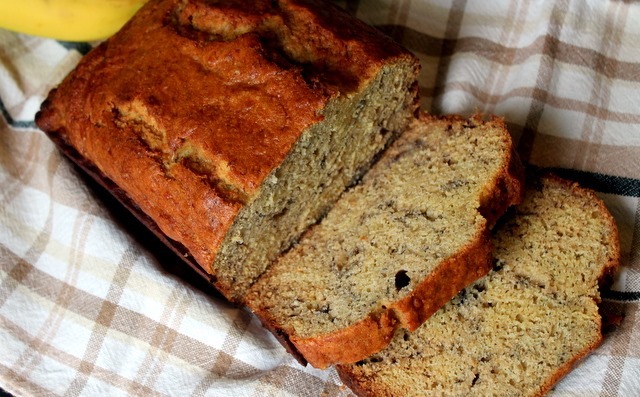 This banana bread has amazing simple ingredients - you just know it's good :) Thanks for sharing - this brought a big smile to my face thinking about my grandma! yuuum. just what i'm craving! i'll take a slice please! I want to make this right now! Banana bread is my absolute favorite. Any recipe from a mom or grandma is a winner in my book. My grandmother wasn't the *best* cook but she could bake. One time for my birthday she made a yellow cake with chocolate frosting. The frosting had coffee grounds in them - just a hint of coffee with chocolate - sooo good! I love your story behind the recipe just as much as the looks of that bread! I can so relate. <3 I still have some of my great-grandma's recipe books. And looking through them makes me feel closer to her. 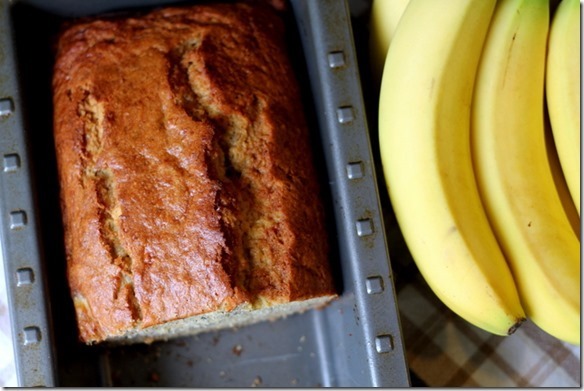 Banana bread is a staple in my house. Both my husband and I love it! In fact, I have lots of bananas at home right now and will likely be whipping some up this weekend and now I have a new recipe to try! I LOVE making my grandma's recipes! I have quite a few that I enjoy making and when I do, it always brings back such great memories of her. Boy, do I miss her terribly. Looks yummmmmy! Love me some banana bread! This recipe looks similar to a recipe I have from my grandmother too! The recipes I have from her are easily some of my favorites. This looks so perfect! Sometimes you just need something simple...I've been craving banana bread lately too! Banana bread is a favorite of mine! My grandmother had all of her recipes on scraps of card or recipe notes. Now everything is becoming so digital! I am going to pin your recipe. Thank you for sharing! This reminds me of one of my favorite stories about my grandma! Apparently I was a biter too when I was little, so one time I but my grandma, and she bit me right back! Haha! (I'm sure not very hard.) And my mom said I wasn't happy about it, but after that, I never bit anyone again! There's nothing like a good old fashioned banana bread! Grandma's always know best and are the BEST cooks. That's one thing I hope to learn from my Grandma, all of her favorite recipes! My grandma made the BEST Monkey bread. Essentially it's Pillsbury croissants cut into quarters then rolled into cinnamon and sugar, put into a bunt cake pan (layered) and then baked. Once cooked you pour more cinnamon /sugar boiled down over top- SOOO good..I'm' not doing the recipe justice but it is amazing! !